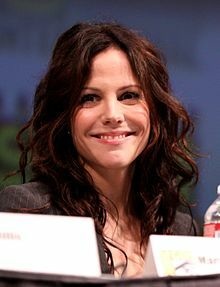 Mary-Louise Parker (born August 2, 1964) is an American actress and writer. After making her stage debut as Rita in a Broadway production of Craig Lucas's Prelude to a Kiss in 1990 (for which she received a Tony Award nomination), Parker came to prominence for film roles in Grand Canyon (1991), Fried Green Tomatoes (1991), The Client (1994), Bullets over Broadway (1994), Boys on the Side (1995), The Portrait of a Lady (1996), and The Maker (1997). Among stage and independent film appearances thereafter, Parker received the Tony Award for Best Actress in a Play for her portrayal of Catherine Llewellyn in David Auburn's Proof in 2001, among other accolades. Between 2001 and 2006, she recurred as Amy Gardner on the NBC television series The West Wing, for which she was nominated for the Primetime Emmy Award for Outstanding Supporting Actress in a Drama Series in 2002. She received both the Golden Globe and Primetime Emmy Awards for her portrayal of Harper Pitt on the acclaimed HBO television miniseries Angels in America in 2003. Fort Jackson, South Carolina, U.S.
Parker went on to enjoy large success as Nancy Botwin, the lead role on the television series Weeds, which ran from 2005 to 2012 and for which she received three nominations for the Primetime Emmy Award for Outstanding Lead Actress in a Comedy Series between 2007 and 2009 and received the Golden Globe Award for Best Actress – Television Series Musical or Comedy in 2006. Her later film appearances include roles in The Spiderwick Chronicles (2008), Red (2010), R.I.P.D. (2013), and Red 2 (2013). Since 2007, Parker has contributed articles to Esquire magazine and published her memoir, Dear Mr. You, in 2015. In 2017, she starred as Roma Guy on the ABC television miniseries When We Rise. In 2018, she appeared as a political consultant in the show Billions on Showtime. Parker was born in Fort Jackson, South Carolina. The youngest of four children, she is the daughter of Caroline Louise (née Morell) and John Morgan Parker, a judge who served in the U.S. Army. Her ancestry includes Swedish (from her maternal grandfather), English, Scottish, Irish, German, and Dutch. Because of her father's career, Parker spent parts of her childhood in Tennessee and Texas, as well as in Thailand, Germany, and France. She described her childhood as "profoundly unhappy," further noting that, "My parents did everything they could; I had books, clothes, a home and a warm bed, but I was never happy." She graduated from Marcos de Niza High School in Tempe, Arizona. Parker majored in drama at the University of North Carolina School of the Arts and graduated in 1986. Parker got her start in acting with a role on the soap opera Ryan's Hope. In the late 1980s, Parker moved to New York. After a few minor roles, she made her Broadway debut in a production of Craig Lucas' Prelude to a Kiss, playing the lead role of Rita, in 1990. She moved with the production when it transferred from its origin Off-Broadway. Parker won the Clarence Derwent Award for her performance and was nominated for a Tony Award (although she did not play the role when the film was made). In 1989 she was in the film Longtime Companion, a film starring Campbell Scott, Bruce Davison and Dermot Mulroney about the emergence and devastation of the AIDS epidemic. Parker starred with Kevin Kline in Grand Canyon (1991); with Kathy Bates, Mary Stuart Masterson, and Jessica Tandy in Fried Green Tomatoes (1991); with Susan Sarandon and Tommy Lee Jones in The Client (1994); with John Cusack in Bullets over Broadway (1994); and with Drew Barrymore and Whoopi Goldberg in Boys on the Side (1995), as a woman with AIDS. Parker's next role was in a movie adaptation of another Craig Lucas play, Reckless (1995), alongside Mia Farrow, followed by Jane Campion's The Portrait of a Lady (1996), which also starred Nicole Kidman, Viggo Mortensen, Christian Bale, John Malkovich and Barbara Hershey. In addition, she appeared alongside Matthew Modine in Tim Hunter's The Maker (1997). Parker's theater career continued when she appeared in Paula Vogel's 1997 critical smash How I Learned to Drive, with David Morse. In the late 1990s, she appeared in several independent films, including Let the Devil Wear Black and The Five Senses. She starred alongside Sidney Poitier in the 1999 movie The Simple Life of Noah Dearborn. On December 7, 2003, HBO aired a six-and-a-half-hour adaptation of Tony Kushner's acclaimed Broadway play Angels in America, directed by Mike Nichols. Parker played Harper Pitt, the Mormon Valium-addicted wife of a closeted lawyer. For her performance, Parker received the Golden Globe Award and Primetime Emmy Award, both for Best Supporting Actress in a Miniseries or Television Film. In 2004, Parker appeared in the comedy Saved! and a television film called Miracle Run, based on the true story of a mother of two sons with autism, as well as appearing in the lead role in Craig Lucas' Reckless on Broadway. The production, directed by Mark Brokaw, earned Parker another nomination for a Tony Award for Best Actress in 2005. In November 2005, Parker was the subject of a career exhibition at Boston University, where memorabilia from her career were donated to the University's library. In 2006, Parker received the Golden Globe Award for Best Actress – Television Series Musical or Comedy, given by the Hollywood Foreign Press Association, for her lead role in Weeds. In that category, she defeated the four leads of Desperate Housewives. She dedicated the award to the late John Spencer, known for his work as Leo McGarry on The West Wing. After receiving the award, Parker stated: "I'm really in favor of legalizing marijuana. I don't think it's that controversial." In March 2007, Parker played the lead role in the television film The Robber Bride. She then portrayed Zerelda Mimms in the Andrew Dominik film The Assassination of Jesse James by the Coward Robert Ford, which opened in cinemas in September 2007. Parker appeared alongside Brad Pitt, Casey Affleck, Sam Rockwell, and Garret Dillahunt. In August 2007, Parker continued her role in the third season of Weeds. Parker appeared in 2008's The Spiderwick Chronicles and in Off-Broadway's Playwrights Horizons production in the New York premiere of Dead Man's Cell Phone, a new play by Sarah Ruhl, alongside Drama Desk Award winner Kathleen Chalfant. She filmed the Donna Vermeer film Les Passages alongside Julie Delpy. Following this, she returned to work on the fifth season of Weeds. Parker took the lead role in the Roundabout Theatre Broadway revival of the play Hedda Gabler, running from January through March 29, 2009. The play garnered a series of negative reviews. Parker starred opposite Bruce Willis in the film Red, an adaptation of the comic book miniseries of the same name. The film was released on October 15, 2010. In 2011, Parker became the host for the tenth season of the PBS documentary series Independent Lens. In 2013 she played roles in both Red 2 and R.I.P.D. She appeared in the Broadway Manhattan Theatre Club production of the play The Snow Geese by Sharr White at the Samuel J. Friedman Theatre from October 24 through December 15, 2013. The play was directed by Daniel J. Sullivan and also starred Danny Burstein and Victoria Clark. Parker starred in the new play by Simon Stephens, Heisenberg, produced Off-Broadway by the Manhattan Theatre Club. The play, directed by Mark Brokaw, opened on June 2, 2015. The play extended its run, closing on July 11, 2015. The play transferred to Broadway at the Samuel J. Friedman Theatre, with previews starting on September 20, 2016, officially opening on October 13, with Parker and Denis Arndt reprising their roles. Since 2007, Parker has contributed articles to Esquire magazine. In November 2015, Scribner Books, an imprint of Simon & Schuster, published her memoir in letters titled Dear Mr. You. From 1996 to November 2003, Parker dated actor Billy Crudup. Parker was seven months pregnant with their son, William Atticus Parker, born in 2004, when their relationship ended. William's godmother is actress Susan Sarandon. In December 2006, Parker began dating actor Jeffrey Dean Morgan, whom she met on the set of Weeds. On February 12, 2008, Parker and Morgan announced their engagement, only to break up the following April. In September 2007, Parker adopted a baby girl, Caroline Aberash Parker, from Ethiopia. In 2013, Parker was honored for her work with Hope North, an organization that works in the educating and healing of young victims in Uganda's civil war. The actress began her involvement with the organization after meeting a former victim of Uganda's civil war. Parker lives in Brooklyn Heights. ^ a b c d Gordon, Meryl. "Mary-Louise Parker Likes to Reveal Herself". MORE Magazine. Archived from the original on September 3, 2014. Retrieved August 28, 2014. ^ "Parker's career makes leap with 'Canyon', 'Tomatoes'". San Antonio Express-News. nl.newsbank.com. January 16, 1992. Retrieved November 7, 2010. ^ "Mary-Louise Parker : Biography". IMDb. Retrieved April 11, 2016. ^ "Parker, Mary-Louise". Archived from the original on January 7, 2008. Retrieved October 8, 2007. 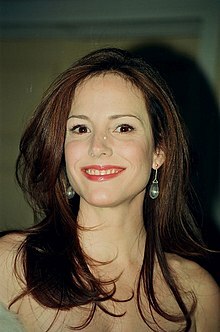 ^ Mary-Louise Parker Biography (1964–). Film Reference.com. ^ Robertson, Campbell. "You're Welcome to See Her Live, Not to Ask About Her Life". The New York Times. Retrieved January 5, 2013. ^ "Mary-Louise Parker | Television Academy". Emmys.com. Retrieved April 11, 2016. ^ "14 Tony Nods For 'Spamalot'". CBS News. Retrieved January 5, 2013. ^ Account (January 17, 2006). "Parker: 'Legalise Cannabis'". Contactmusic.com. Retrieved April 11, 2016. ^ "Playwrights Horizons". Playwrights Horizons. Archived from the original on September 4, 2012. Retrieved April 11, 2016. ^ Broadway Plucks Mary-Louise Parker from Weeds Archived August 15, 2008, at the Wayback Machine. TV Guide. ^ "Red Begins Principal Photography". /Film. January 18, 2010. Retrieved January 18, 2010. ^ "Mary-Louise Parker - Esquire". ^ Parker, Mary-Louise (2015). Dear Mr. You (First Scribner hardcover ed.). New York, NY: Scribner. ISBN 9781501107832. OCLC 904813238. ^ Susman, Gary (January 14, 2004). "Mary-Louise Parker names son after Billy Crudup". Entertainment Weekly. Retrieved April 11, 2016. ^ McDonnell, Jen (December 10, 2007). "Weeds Star's Relationship Hasn't Gone To Pot". Archived from the original on December 12, 2007. ^ Rush, George (February 12, 2008). "Mary-Louise Parker and Jeffrey Dean Morgan Engaged". The New York Daily News. ^ "Mary-Louise Parker, Fiancé Break Off Engagement". People. April 8, 2008. Retrieved January 6, 2013. ^ Jones, Oliver (September 17, 2007). "Mary-Louise Parker Adopts a Child from Ethiopia". People. ^ "Reading is a favorite activity for Mary-Louise Parker and her kids". Celebrity Baby Blog. February 15, 2008. Retrieved May 12, 2008. ^ "Fall Season 2013: Episode 3 | In the Mixx". Inthemixxshow.com. Retrieved April 11, 2016. ^ Morris, Bob. "Mary-Louise Parker on Life With and Without Men", The New York Times, November 15, 2015. Accessed January 6, 2018. "The other day in the Brooklyn Heights duplex Mary-Louise Parker shares with her two children and Mrs. Roosevelt, a cocker spaniel in a red diaper, the actress was stroking one of the oyster shells she keeps in a bowl in her living room." Wikimedia Commons has media related to Mary-Louise Parker.